A last-gasp goal from Loughborough Lightning’s star shooter Mary Cholhok handed Wasps Netball just their second defeat of the season. Mel Mansfield’s side held an eight-goal lead in the final-quarter but the home side came storming back and scored with the final play to take all three points. Lightning extended their winning streak to five with the victory but the Black and Golds still remain top of the Vitality Netball Superleague on goal difference. Mansfield said: “I’m a bit speechless to be honest. It’s really tough to lose a game like that. “I thought that defensively we were brilliant this evening for the whole game and we were in control to start the final-quarter. “We need to be able to punish teams, be more clinical and look after the ball more. “All of those things didn’t happen in the last quarter and we put ourselves under huge amounts of pressure. Wasps opened the scoring from the first centre-pass through Rachel Dunn, but Lightning equalised with a goal from Cholhok on the next possession. Dunn and Cholhok were both in fine form throughout the first-quarter, as the Wasps defenders struggled to contain Lightning’s 6ft 8in Goal Shooter. Jade Clarke and Bongi Msomi linked up well with quick passing to create space in the shooting circle, helping the Black and Golds to a three-goal advantage. Lightning fought back, with an interception from captain Natalie Panagarry sparking a momentum swing. Cholhok continued to shine as the hosts ended the first-quarter with a two-goal advantage. 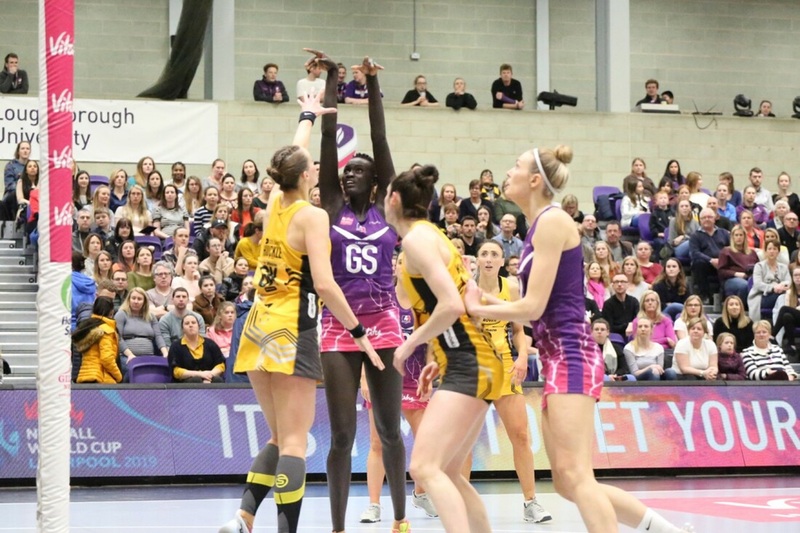 The hosts were fast out the blocks in the second-quarter and soon led by five goals, despite Wasps putting significant pressure on the Loughborough shooters. Panagarry’s star performance continued, highlighted by a series of interceptions and her great hustle to keep the ball in play, with Lightning’s defence taking control. But Wasps worked their way back into the fixture with swift attacking movement and a clinical shooting display by Katie Harris. Josie Huckle started to come out on top against Cholhok as the second-quarter closed, helping her side to a two-goal lead. Msomi proved key in the third-quarter with quick releases helping to negate the hosts’ defensive tactic of cutting off passing lanes. Harris and Dunn showed great composure in the circle to help their side maintain their lead, both sharing the goalscoring load. The duo continued to impress as the fourth-quarter began, with Huckle working hard to limit Cholhok at the other end. Hannah Joseph forced a big turnover to bring her side back within two goals and the momentum was with her side. A turnover from Wasps gave Lightning a foothold and the game came down to the final centre-pass with 30 seconds to play. The hosts worked the ball through the court calmly and found Cholhok, who scored with the final shot of the game to give Loughborough a 60-59 win. Wasps Netball’s next fixture will see them travel to Manchester Thunder on Saturday 23 March (5pm centre-pass).